Elderly and disabled residents looking to ease their Christmas shopping worries are being urged to use a free service designed to make their trip easier. 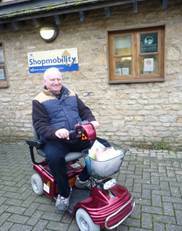 Witney Shopmobility offers the use of a motorised scooter or wheelchair for those who would otherwise struggle to make the most of shopping facilities in the town. Regular users Christopher Deane and Lawrence Hugill are keen to highlight the advantages of the Shopmobility user Christopher Deane 2service. Mr Deane, 74, who lives in the town, said: “I suffer from sciatica and there is no way I could walk to Sainsbury’s and return home with several bags of shopping. Mr Hugill, 79, takes the Villager bus from Shipton-under-Wychwood which now parks at Langdale Hall just yards from the Shopmobility office. Cllr Carol Reynolds, Cabinet Member for Community Safety, said: “Witney Shopmobility is a fantastic service that can make a real difference to people’s everyday lives. Witney Shopmobility offers a range of scooters and wheelchairs as well as providing blankets and waterproof capes for users. It is open four days a week: Mondays, Wednesday, Thursdays and Friday from 9.30 am – 4.15 pm and will remain open until 23 December, re-opening on 4 January. It is based in Langdale Gate, Witney and there is disabled parking nearby.